For other articles with similar names, see Barnum Museum (disambiguation). Barnum's American Museum was located at the corner of Broadway and Ann Street in New York City, United States, from 1841 to 1865. The museum was owned by famous showman P. T. Barnum, who purchased Scudder's American Museum in 1841. The museum offered both strange and educational attractions and performances. In 1841 Barnum acquired the building and natural history collection of Scudder's American Museum for less than half of its appraised value with the financial support of Francis Olmsted, by quickly purchasing it the day after the soon to be buyers, the Peale Museum Company, failed to make their payment. . He converted the five-story exterior into an advertisement lit with limelight. The museum opened on January 1, 1842. Its attractions made it a combination zoo, museum, lecture hall, wax museum, theater and freak show, in what was, at the same time, a central site in the development of American popular culture. Barnum filled the American Museum with dioramas, panoramas, "cosmoramas", scientific instruments, modern appliances, a flea circus, a loom powered by a dog, the trunk of a tree under which Jesus’ disciples sat, an oyster bar, a rifle range, waxworks, glass blowers, taxidermists, phrenologists, pretty baby contests, Ned the learned seal, the Feejee Mermaid (a mummified monkey's torso with a fish's tail), midgets, Chang and Eng the Siamese twins, a menagerie of exotic animals that included beluga whales in an aquarium, giants, Native Americans who performed traditional songs and dances, Grizzly Adams's trained bears and performances ranging from magicians, ventriloquists and blackface minstrels to adaptations of biblical tales and Uncle Tom's Cabin. At its peak, the museum was open fifteen hours a day and had as many as 15,000 visitors a day. Some 38 million customers paid the 25 cents admission to visit the museum between 1841 and 1865. The total population of the United States in 1860 was under 32 million. In November 1864 the Confederate Army of Manhattan attempted and failed to burn down the museum, but on July 13, 1865 the American Museum burned to the ground in one of the most spectacular fires New York has ever seen. Animals at the museum were seen jumping from the burning building, only to be shot by police. Many of the animals unable to escape the blaze burned to death in their enclosures, including the two beluga whales who boiled to death in their tanks. It was allegedly during this fire that a fireman by the name of Johnny Denham killed an escaped tiger with his ax before rushing into the burning building and carrying out a 400-pound woman on his shoulders. Barnum's New Museum opened September 6, 1865, at 539-41 Broadway, but that also burned down, on March 3, 1868. It was after this that Barnum moved on to politics and the circus industry. Barnum's American Museum was one of the most popular attractions of its time. The site at Ann Street was then used for a new building for the New York Herald newspaper. In July 2000 a virtual museum version opened on the Internet, supported by a grant from the National Endowment for the Humanities. The Lecture Room of Barnum's American Museum, 1853. The museum's collection included items collected throughout the world over a period of 25 years. The museum offered many attractions which grew to great fame. One of the most famous was General Tom Thumb a 25-inch tall dwarf who eventually garnered so much fame and success that Queen Victoria saw his performances twice and Abraham Lincoln personally congratulated Thumb on his wedding. Thumb wasn't the only physical oddity there; there was also the Fiji Mermaid and Josephine Boisdechene, who had a large beard, which had grown to the length of two inches when she was only eight years old. As if to supplement Tom Thumb, another famous attraction of the museum was William Henry Johnson, who was one of Barnum's longest-running attractions. Another one of the famous attractions at the museum were Chang and Eng, Siamese twins who were extremely argumentative, both with each other and Barnum himself. The museum also boasted an elegant theatre, called the "Lecture Room," and characterized in the popular Gleason's Pictorial Drawing-Room Companion of 1853, "one of the most elegant and recherche halls of its class to be found anywhere," which would offer "every species of entertainment ... 'from grave to gay, from lively to severe,' ... [and] judiciously purged of every semblance of immorality." Impressively, thses shows "[rivaled] or even [excelled]those of the neighboring theaters." It was possible for these shows to do this because: 1) these performances occurred in spaces labeled lecture halls, helping to distinguish them for those who would never of near a theatre, and 2) "[Barnum] made the theatre into something it had rarely been before: a place o family entertainment, where men and woman, adults and children, could intermingle safe in the knowledge that no indecencies would assault their senses either on stage or off." Additionally, Barnum implemented several morality plays to be shown in his auditorium, many of which taught against the dangers of drinking. Werner points out the accessibility of these performances saying, "many persons who would not be seen in a theatre visited regularly the Museum Lecture Room - Barnum would never consent to calling it a theatre - where the moral dramas of 'Joseph and His Brethren,' 'Moses,' and 'The Drunkard' were performed." These were especially popular with women as alcoholism was becoming rampant among working class men. These plays were oftne seen as the height of family friendly entertainment, because they taught good lessons which were appropriate for all ages. At one point, Barnum noticed that people were lingering too long at his exhibits. He posted signs indicating "This Way to the Egress". Not knowing that "Egress" was another word for "Exit", people followed the signs to what they assumed was a fascinating exhibit — and ended up outside. The five-story building also served great educational value. Aside from the different attractions, the Museum also promoted educational ends, including natural history in its menageries, aquarium (which featured a large white whale), and taxidermy exhibits; history in its paintings, wax figures, and memorabilia; and temperance reform and Shakespearean dramas in the above described "Lecture Room" or theater. It was also the first museum to put human oddities on display as an organized freak show. It was the American Museum that began the modern-day trend of exploiting the human body for the sake of mass entertainment. The museum itself housed a mix of exhibits; some were extremely reputable and historically or scientifically valuable, while others were less so. One of Barnum's most successful attractions was his large selection of living animals, which were a highlight for the visitors who had never seen exotic creatures. Sadly, the animals in Barnum's "happy family" were poorly treated at best and neglected at worst." Their standard of living is exemplified in the beluga whales he kept in a tank in the basement. The whales lived in a small 576 square foot tank, and when they frequently died Barnum "promptly set about procuring additional specimens." ^ a b Tina Kelley (2000-07-01). "A Museum to Visit from an Armchair". The New York Times. Retrieved 2008-04-03. ^ a b c d e f g Dennett, Andrea Stulman (1997). Weird and Wonderful : the Dime Museum in America. NYU Press. ISBN 9780814744215. OCLC 782877979. ^ Darice Bailer (2001-01-21). "The View From/Bridgeport; Museum Invites Visitors to Step Right Up". The New York Times. Retrieved 2008-04-03. ^ a b Barnum, P.T. (1961). Browne, Waldo R. (ed.). Barnum's Own Story. New York: Dover Publications Inc.
^ a b c d Saxon, A.H. (1989). "P.T. Barnum and the American Museum". The Wilson Quarterly (1976-). 13: 130–139. ^ a b c Werner, M. R. (1923). Barnum. 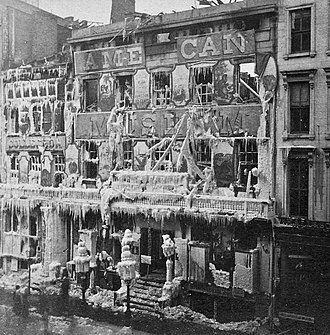 New York: Harcourt, Brace and Company Inc.
^ a b "Disastrous Fire" (PDF). The New York Times. 1865-07-14. Retrieved 2008-04-03. ^ Brown, T. Allston (1903). A History of the New York Stage. 2. New York: Dodd, Mead and Company. pp. 3–8. ^ Michael Frank (2002-06-21). "Will Wonders Never Cease?". The New York Times. Retrieved 2008-04-03. ^ "The Barnum's American Museum Illustrated". Barnum's American Museum Illustrated Magazine. 1850. Archived from the original on 29 March 2008. Retrieved 2008-04-03. ^ "Sunshine and shadow in New York. By Matthew Hale Smith. (Burleigh.) ." archive.org. Retrieved 2017-02-05. ^ Brainerd Dyer (1958-07-13). "Today in History". The Los Angeles Times. Retrieved 2008-04-03. ^ "American Museum, New York". Gleason's Pictorial Drawing-Room Companion. IV (5). 1853-01-29. p. 73. Retrieved 2018-11-26. ^ Barnum, Phineas Taylor (April 1871). Struggles and Triumphs: Or, Forty Years' Recollections of P. T. Barnum. New York: American News Company. p. 140. Retrieved 2018-11-26. Wikimedia Commons has media related to Barnum's American Museum. The Lost Museum – Online version of the museum, published in the year 2000. This page was last edited on 13 April 2019, at 21:58 (UTC).